A fragrant, delicious mix of Thai chili paste and holy basil leaves leaves (called Grapao in Thai). Just add a few teaspoons to any vegetable or meat stir-fry, or add it to soup or anything else you can imagine, to create a simple, authentic Thai meal. Ingredients: soya bean oil, chili peppers, holy basil leaves, garlic, salt. No preservatives. Packed in a glass jar. Product of Thailand. Fresh holy basil leaves are very delicate and typically not possible to find in any markets outside of areas with tropical weather. Our chile paste with holy basil has become one of our most popular products though, as the holy basil flavor is prominent in this simple inexpensive product ready-made-for-stir-fry. Here we use it to make an authentic Gai Pad Grapao. 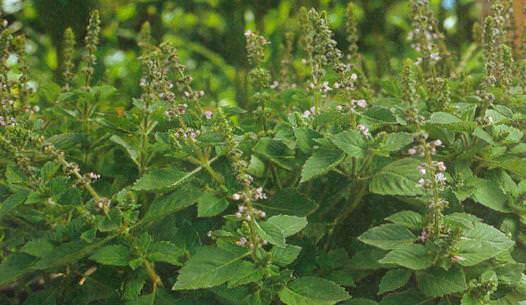 Below are testimonials received from customers about chili paste with holy basil leaves. Carla, Batavia NY. Yum Yum Yum and thanx again!! my order was delivered today JUST before lunch; saltine crackers, tuna and fruit...HA! dumped a bunch of Holy Basil and garlic on and thru it in some Clear Soup!! I am in Heaven! Brad, Midland TX. 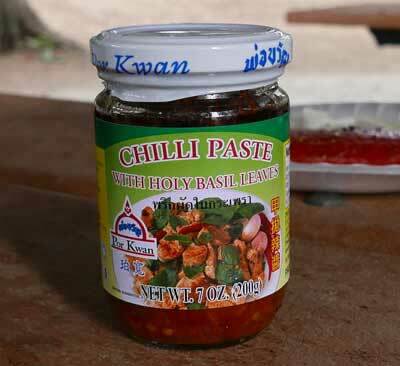 If you can't get Fresh Holy Basil for a dish like Chicken with Green Chili and Holy Basil, the Por Kwan Chili Paste with Holy Basil Leaves makes for a great substitute for the chilis and Holy Basil leaves. I acheived better than expected results using this, and my guests were wowed. The way your order is packed is excellent. By the way, the customer service I got whem I called was very informative and friendly. Michelle, Leonardo NJ. I received the street-vendor wok (14") that I ordered and I absolutely love it! I was a little scared of it at first---I thought it would be smaller but it fits on my stove perfectly and I am addicted to it. The spatula you recommended is also great. I am also addicted to your chili paste with holy basil . I appreciate that you list all of the ingredients, I am a strict vegetarian so it helps to know what is in the sauces and pastes. Many thanks and looking forward to my next order!